I'm not entirely sure how rare (or not) this tape actually is. 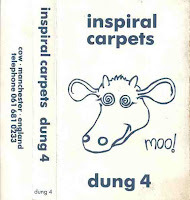 It was issued in 1988 on the Inspiral Carpets own Cow label with the catalogue number DUNG 4. 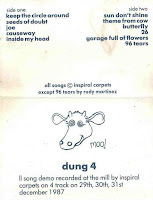 I still actually remember buying it from Track Records in York principally because it looked interesting and was cheap, £3.99 I think which was a bargain for eleven tracks and I was only a skint young lad at the time spending any money I could lay my mucky mitts on on records. This is a bit of a classic though and still actually sounds quite good today. I always thought of this as the first album, recorded over three days after Christmas in 1987. As far as I know it was only ever on tape and will have therefore bypassed a lot of peoples ears. I still think "Joe" and "Butterfly" sound better than the later versions. Don't suppose you fancy selling it? I still have this in my atic, never got round to converting it so thanks! ^ What Carlos said...except replace attic with the ex-wife. Who had a skip. Cheers!